Up, Down, Left, Right, Click! Home > News > Up, Down, Left, Right, Click! 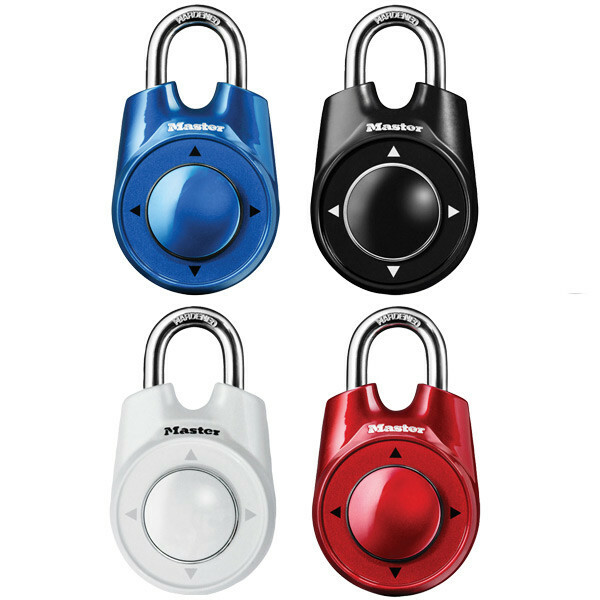 Those of you who enjoy video games will appreciate the new directional design of Master Lock’s new 1500ID Speed Dial combination lock. Its locking mechanism breaks away from the long-standing numerical standard and adopts a D-pad design that Master Lock is saying will be easier to use and much more secure. Moving the spring-loaded dial in a customizable sequence through the four directions opens the lock, and the combination can be of any length and can be changed at any time. They also include additional passcode markers that you can apply over the directional arrows in case you’d prefer to memorize a series of letters or numbers. The engineer in me wonders how well the moving parts in the new design are going to stand the test of time… I worry that having more degrees of freedom leaves more opportunities open for mechanical failure. But, it feels nice and solid in the hand when you pick it up (I tracked one down in the hardware store down the street), and Master Lock is a company I trust, so I would probably give one a shot. At any rate, I can’t seem to hold on to padlocks for very long – I always end up losing the combination or forgetting them in my gym locker. One blogger makes a good point that the pressure is on the user to avoid picking a directional combination that’s easy to memorize (god codes, Street Fighter combos, the circular sweep needed for the hammer throw in Nintendo Track & Field II). Outside of the potential for poor sequence selection, the lock has an infinite number of possible combinations, and they use something called “anti-shim technology” to prevent lock picking (which is remarkably easy in standard models). Up until this point, we’ve been locked (no pun intended) into choosing between the number dial and the lock-and-key models for protecting our valuables. What do you think? Would you spend the extra few dollars on a directional lock? Is it worth their resources for Master Lock to create a new product line or should we just stick with the original go-to designs? My son has a directional masterlock, set the combo, now we cannot open it. We have been trying all sorts of different combos to no avail. Can we reset it somehow withou it being unlocked? Is the lock strong enough to hold a small primate in a cage? Say 40lbs?? I’m thinking the answer is yes, though I can’t be sure. Do you have a collection of 40lb primates to contain? What’s that coming out of her nose? Space Balls!!! Oh sh#*!!! There goes the planet. Thanks for all of your input! Looking forward to hearing about it. This thing looks superb, but one questions is pressing on my mind, couldn”t anyone just either slide the lock at the back to the reset and press the lock up towards something so that it clicks twice so that it clears the lock? or just simply click the lock up twice? Bruce, I think you are right on point. The combination has to be entered before opening the lock and resetting it. But I did notice that they warn to absolutely not flip the reset switch while the lock is closed… wonder what would happen then? Up Down Up Down Left Right Left Right A B START! Bruce – that was the cheat for contra on the original Nintendo.